Now, it is holiday time for kids and they want something or the other to eat or drink in between meals. 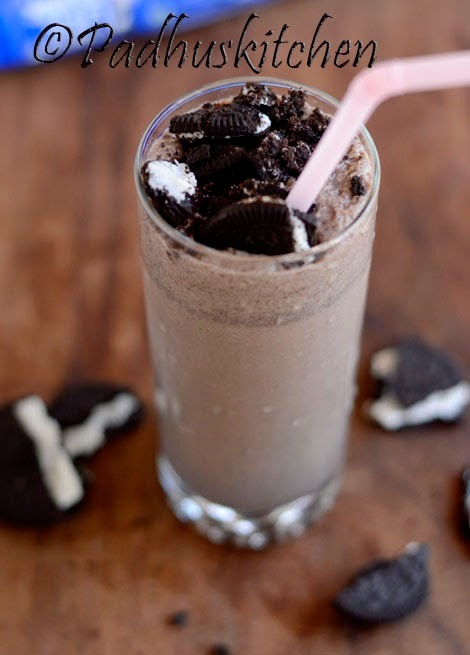 This Oreo milkshake is so easy to make and is a perfect drink, especially on a hot sunny day. You can involve your kids also in making this and I am sure they will love to help and also drink it. You can prepare this milkshake with or without ice cream. If you are preparing it without ice cream, I recommend milk with 4.5% fat or above. I have tried both versions and both are equally delicious. Break oreo cookie into 3-4 pieces. In a blender, blend 5 oreo cookies, ice cream and milk together. Pour into a glass, garnish with some crushed oreos and serve cold. Check out more milkshake and juice recipes and also my Oreo Owl cupcake recipe. Awesome looking milkshake. Just the one required in the summer time.